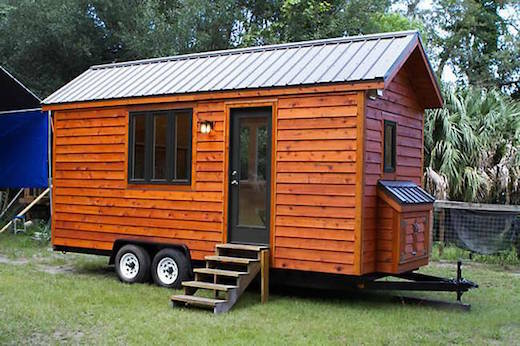 Tiny homes are a great way to downsize, and many have found the freedom they never imagined possible by moving into one. However, living small comes with it’s own set of challenges, and adequate usable living area is not the least of them. 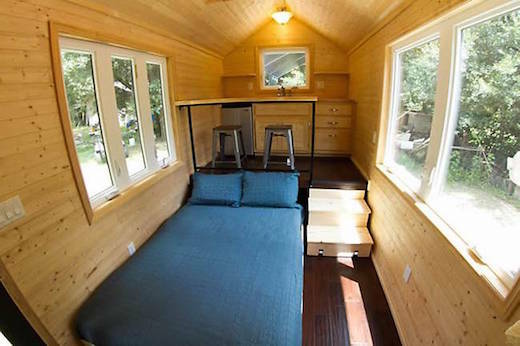 Many tiny home designers solve this problem by including a loft where the bedroom is usually located. But getting to this loft normally requires climbing up a ladder, which is not ideal, especially for older people. 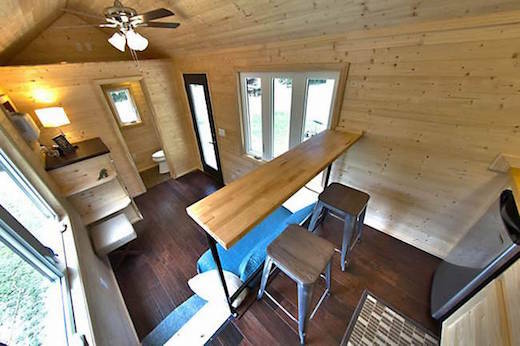 Which is why this tiny house design by Tiny Home Builders of Florida is so unique. 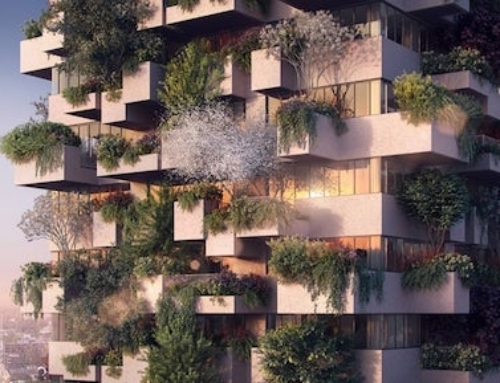 It’s spacious and cozy, and there is no loft. 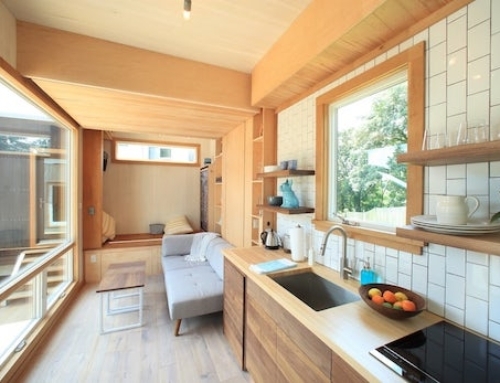 The home measures just 160 square feet, enclosed in an 8′ x 20′ space. Instead of putting the bed on a raised platform, the designers actually removed the kitchen area from the rest of the dwelling in this way. However, the kitchen area is only slightly raised, and is accessible via three wide and low steps, which also offer a lot of storage room. The bed itself is then tucked under this raised kitchen platform. 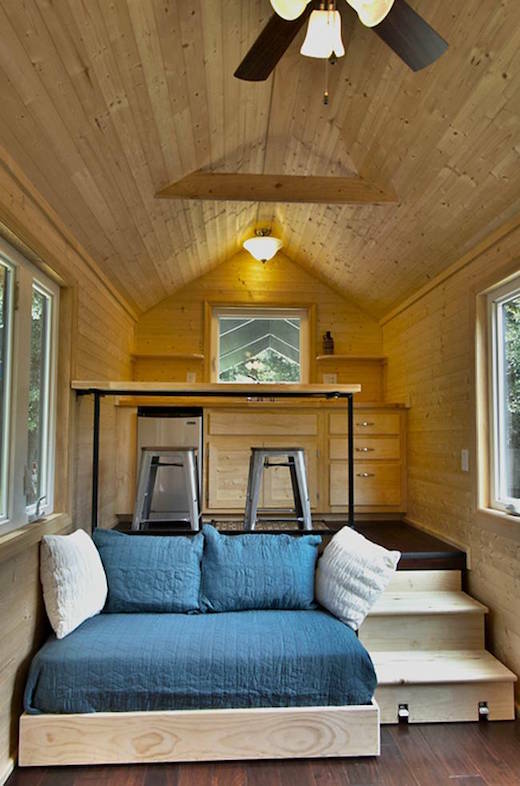 Even in the tucked-in position, about half of the bed sticks out, and functions as a very comfortable and cozy sofa, which is much better than most sofas seen in tiny homes. 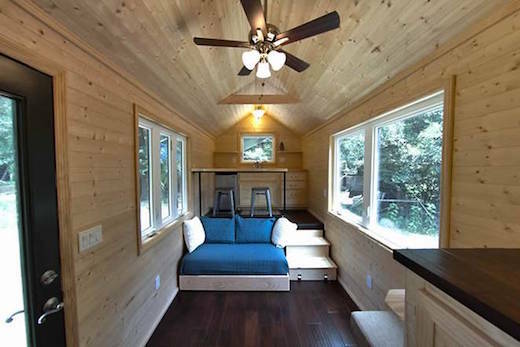 And when it is fully pulled out, it offers ample amount of sleeping room, and also headroom, which is something that is often lacking in lofted bedrooms. 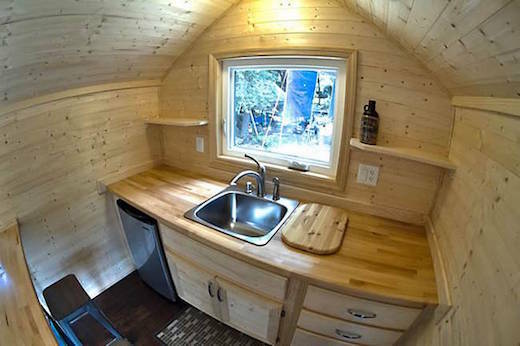 The kitchen is fully equipped with a sink, stove, fridge and even a small island for eating or preparing food. 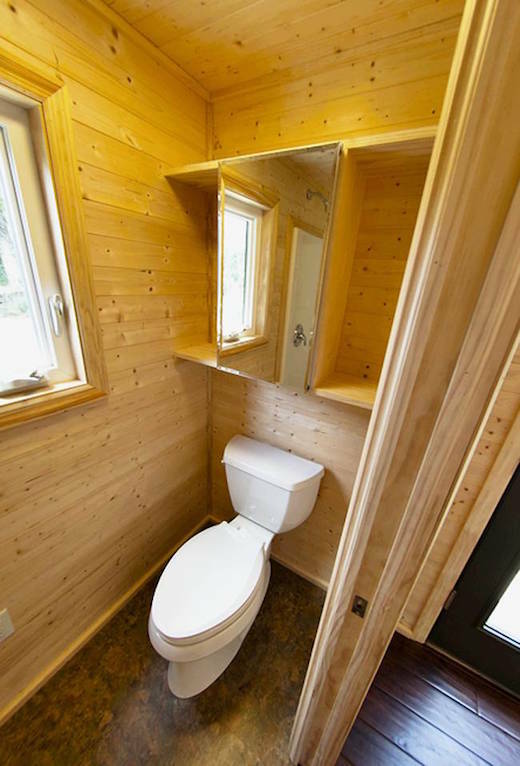 The house also features a bathroom, which is equipped with a toilet and a 36-inch shower. 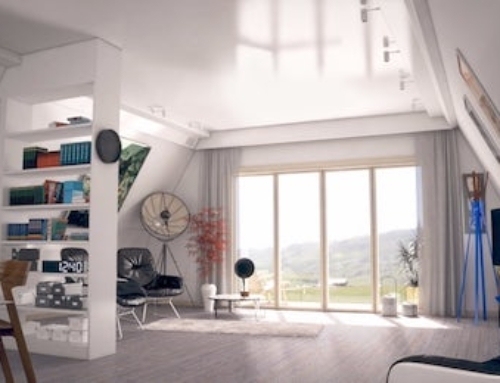 Judging from the pictures, there is no working table, and the addition of one would make this house design pretty much perfect. 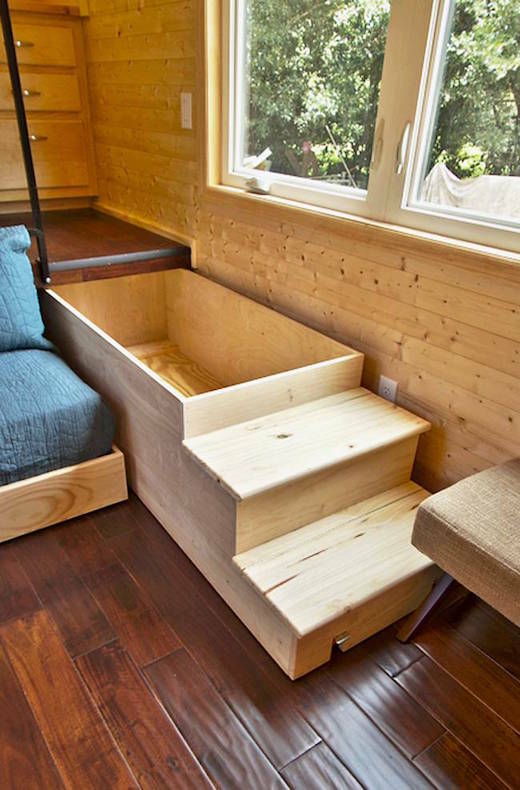 For storage, there is a closet space as well as a loft area over the bathroom. 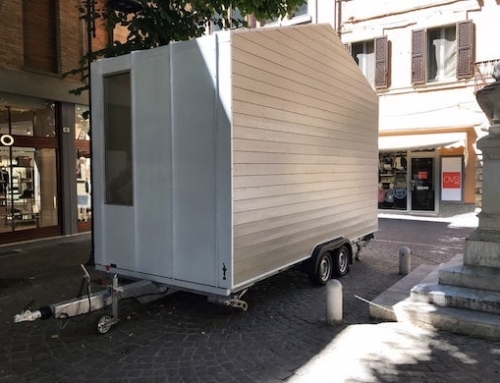 The home is also mounted on wheels, so it can be taken anywhere the owner wants. Very Cool Trend unfolding here. I LIKE it !